FRIDAY: A party that will be based in the University building. Dinner and drinks on the house! Peter Vrabec - security compliance check in Fedora Security How sectool became obsolte by scap-workbench? Motivation, status, pros and cons. Milan Brož - Disk encryption (not only) in Linux Kernel A low level insight into Full Disk Encryption (FDE). Why encryption mode matters or why using encryption on hardware level is not always the best option. Some examples and short description of software level FDE implementations and features in various operating systems (with main focus to Linux dmcrypt/LUKS but also Truecrypt, loop-AES and Bitlocker). Tom Coughlan - Trends in the Enterprise Storage Market Kernel Big Data, Unstructured Data, Scale-Out vs. Scale-Up, Virtualization, pNFS, Solid State Storage. What is the future of SAN, NAS, DAS? What role will Linux play in the new environment? Vojtech Juranek - Continuous integration with Jenkins CI JBoss Jenkins is continuous integration server. This talk will cover brief explanation what the continuous integration (CI) is, what it's good for and how to setup CI for your project either on dedicated server or in the cloud (PaaS). The talk is intended for developer with zero or limited experience with continuous integration. Examples will be given in non-Java languages (Python, Ruby). Christian Sadilek - JBoss Errai Framework JBoss offers a concise programming model to build next generation web applications. It enables powerful client-server communication and brings Java Enterprise standards to the browser by leveraging the GWT compiler. Geoffrey De Smet - What are Drools, Guvnor and Planner? JBoss Drools Planner optimizes planning problems. Better planning algorithms can help save the environment, reduce costs and improve service quality. All organisations have planning problems, such as employee rostering, task scheduling, vehicle routing or bin packing. Yet, they hardly optimize those problems. Why? Because those problems are “NP-complete”: computationally very difficult and humanly impossible to optimize. Simon Schampijer - Sugar: using the GNOME platform to build a learning platform Desktop Adapt to new technologies like GTK3 and gobject-introspection. Shaun McCance - The GNOME Help System Desktop Diving Deeper: Tapping the Potential of the GNOME Help System Mallard and the GNOME help system solve real problems faced by open source projects in innovative ways, and provide the groundwork for new ideas. See how Mallard really works and learn how you can take it even further. Adam Tkáč - DNSSEC in Fedora 17 Core How DNSSEC works, what can it do for you, why should I care? Pavel Šimerda - IPsec in Fedora Core Comparison of IPsec IKE implementations in Fedora. Two new IKE implementation are getting into Fedora. Look forward to Racoon2 and Strongswan. Rainer Gerhards - rsyslog future Core rsyslog vs. journald - myths and facts. Where is rsyslog going? Michal Fojtík, Fracesco Vollero - Cloud in the wild Cloud Examples about how to use Deltacloud API to speak with many different clouds. Tomeu Vizoso - GTK+ 3 development in Python Lab Building a Python application using GObject Introspection. Tomas Radej & Stano Ochotnicky - Fedora Package Review Lab We'll go through process of adding new package into Fedora with fedora-review tool. Depending on audience we could also show how to create an extension/plugin for specific guidelines. Hotel Avanti **** - closest hotel, a 5-10 minute walk to the venue. Free wifi. Avanti has given us a special rate - CZK 1337 (€52) inc. VAT for a double-bed room with breakfast and parking lot. If you want to use this rate, please contact Jiri Eischmann (eischmann@redhat.com) and make a binding booking by January 12th. If you're going to attend GTK+ and GNOME Docs hackfests, KDE SIG FAD, or oVirt meetup, you don't have to book your room this way. Brno (BRQ, 0.5 million passengers transported a year) - connections to London-Stansted (Ryanair), London-Luton (Wizz Air), Bergamo, Italy (Ryanair), Rome (Wizz Air), Prague (Czech Airlines/SkyTeam), Moscow-Domodedovo, St. Petersburg (CCA), Moscow-Vnukovo (Yakutia Airlines, UTair Aviation). Smart Wings provide seasonal flights to various destinations in Greece and Spain. Madrid (MAD) – (via Dusseldorf with Lufthansa) € 150. Mandrid (MAD) – (direct flight with Air Berlin) € 144. Bratislava (BTS, 2 mil.) - 130 km from Brno, 7 airlines serve regular flights to over 30 destinations, there is a hub of Ryanair (cheap flights to many European cities). There is no direct connection between the airport and Brno. Trains (€ 7, 1.5 hour) and buses (€ 9, 2 hours) go to Brno from the city center every hour. Berlin – from Berlin Hauptbahnhof several trains every day, 7.5 hours, € 39. Berlin – 555 km, 5.2 hours. Parking lots are available right in the university campus where the conference would take place. Public Transport Tickets: If you want to use public transport, buy tickets only for 100+101 zones! If you're staying in Brno for several days, consider buying a 5-day public transport ticket which costs CZK 250. There are several places where you can buy it, but the best one for you is probably the main railway station, where you can buy it at any counter (look for the international ones because they more likely speak English). From Main railway station take tram #1 (towards Řečkovice). Get off the tram on 5th stop - Hrnčířská (after apx 10minutes). Take the street on the left - Hrnčířská - up and after apx 300 meters the building on your right hand is the University. From Main bus station (Zvonařka) take bus number 60, get off on second stop - Nové Sady (apx 2minutes). Take tram #1 towards Řečkovice. After two stops you are on the Main railway station, follow instructions above. From Česká street (City center) take trolley 32 (towards Královo pole) for 4 stops and get off on stop Botanická right in front of the main University building. It's pretty much the same as going from the main train and bus stations to the venue. You get off the same stop of #1 tram (Hrčířská), you just walk the opposite direction (see the picture in the lodging section above). If you're a group of more people, consider taking and sharing a taxi. It should cost CZK 200-300 and it's the easiest and quickest way to get to the office. Hotel personnel will certainly help you order the right taxi service. If you want to use public transport, the quickest way is probably taking a #67 bus on Reissigova Street (towards Jundrov), get off on Skácelova Street stop and go a few hundred meters on Purkyňova Street to the office. You can also use Google Maps to find the best way (GM work with public transport in Brno). 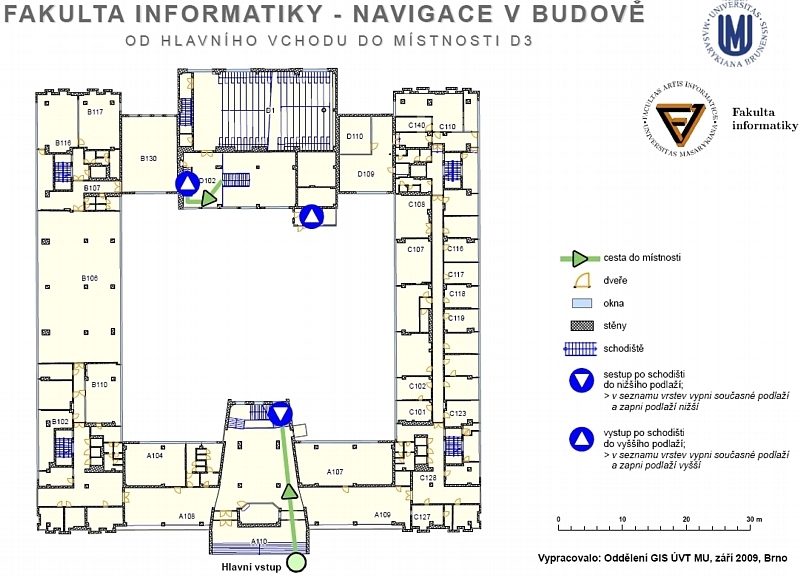 Enter Avanti Hotel (Střední 61, Brno) as the starting point and Purkyňova 99, Brno as the destination, and select "Public Transport" as the means of transportation ("train" icon). GM will calculate you the best combination of public transport and walking. This page was last edited on 23 March 2019, at 14:17.